Artificial Grass Glue: Which is Best – Single or Two-Part Adhesive? Posted on 4th August 2018 at 11:44 am. Artificial grass glue is a versatile adhesive that can be utilised in many different ways as part of the fake lawn installation process. 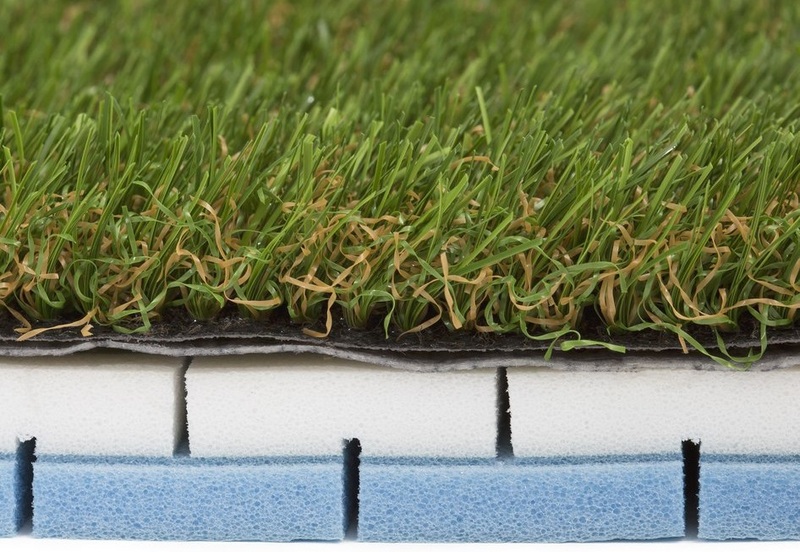 Artificial grass adhesive comes in two different forms: single part and two part. Of course, each type has its strengths and its weaknesses and both types certainly have their place within the artificial grass installer’s toolkit. Today, we are going to be taking a closer look at the differences between each form of adhesive and discussing the pros and cons in a bid to help you make an informed decision as to which type of adhesive you should be using to complete your project. Before we can decide which type of adhesive is best, we’ll need to understand exactly what each type of adhesive is and how it works. What is a Single Part Adhesive? Single part adhesives, such as Aqua Bond, are a single component, moisture-curing adhesive that is typically supplied in 310ml cartridges or tubes. The adhesive is applied through a plastic nozzle, via a mastic gun applicator. The glue consists of polyurethane, which is produced by diphenylmethane diisocyanate. Single part adhesive does not require any mixing prior to application and, once opened, you’ll typically get around 30 minutes to use it up before any exposed glue will become too stiff to allow any further use. Curing times depend upon the outside temperature, but the adhesive will have set after a maximum of 8 hours. What is a Two-Part Adhesive? As the name suggests, two-part adhesives are, indeed, supplied in two parts. The first of these parts is, again, polyurethane. The second is supplied in a separate container and consists of a hardener additive, which is a 100% liquid isocyanate. Two-part adhesives are usually supplied as either a 5kg tub of polyurethane alongside a 0.5kg container of hardener, or a 10kg tub of polyurethane with a 1kg container of hardener. For best results, the two parts are mixed together with a motorised paddle mixer; they may also be mixed manually. Once the two parts have been thoroughly combined, you’ll typically have around 30–60 minutes of working time, depending upon the outside temperature. The warmer the climate, the less time you’ll have. The adhesive will set after a maximum of 24 hours, with the final strength being achieved after 4 days. 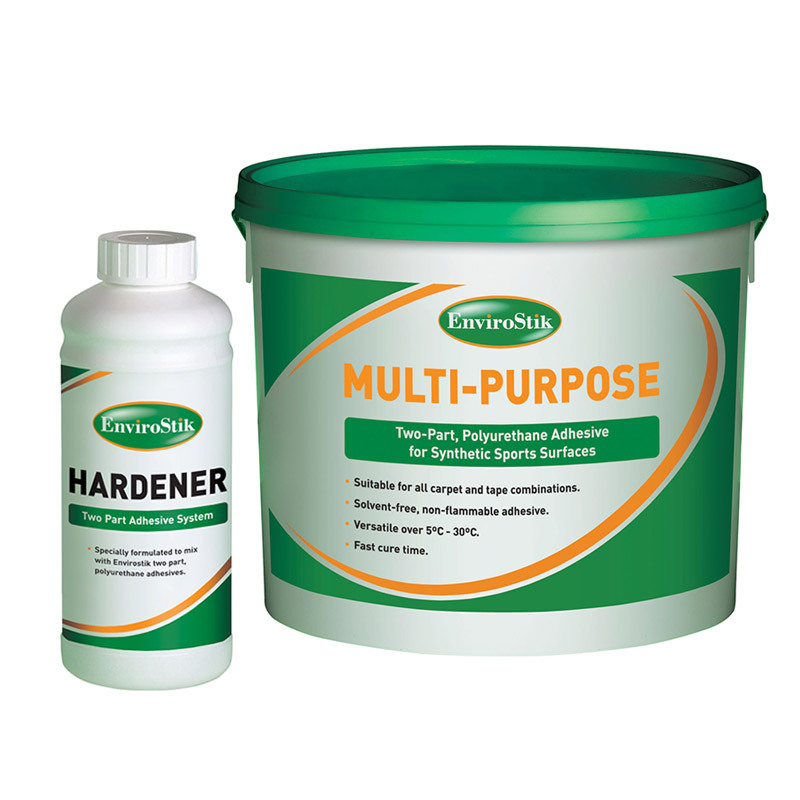 Two-part adhesives are available in a variety of forms, including Multi-Purpose (ideal for a wide range of general uses), Ultra-Fix (for sports pitches), Wet-Fix (ideal when working in low temperatures or damp conditions), or Flexibond (for bonding short pile, sand-free turf to rubber shockpads or tarmacadam). Which Type of Adhesive is Best? Well, there’s no short answer to this as there is no one-size-fits-all solution. Both types of adhesive have their place. When it comes to recommending which one is best it all comes down to the intended use. To help you decide which form of adhesive you should consider using, let’s look at some typical applications and weigh up the pros and cons of each adhesive in each situation. When joining two pieces of grass to form an invisible seam, you’ll need to use joining tape and adhesive to secure the grass. But which type of glue should you use? When joining pieces of artificial grass together, it is very important that you cover the entire length of the joining tape with glue, leaving a 25mm gap at the edges of the tape, to ensure a sufficient bond is achieved between the backing of your turf and the joining tape. As we know, single part adhesive is supplied in 310ml cartridges and is applied via a plastic nozzle. This nozzle dispenses a thin bead of adhesive, with each cartridge containing a coverage rate of approximately 0.3 square metres, depending upon substrates. A 5kg tub of two-part adhesive, on the other hand, has an approximate coverage rate of around 2 square metres of joining tape, depending, of course, on the thickness applied to your tape – you should aim for around 2mm. To cover a 10m length of joining tape, you would need 1 tub of 5kg two-part adhesive or around 9 cartridges of single part adhesive. When you compare costs, one 5kg tub of two-part adhesive is around the same price as around 4.5 cartridges of single part adhesive. Therefore, it is far more cost-effective to use two-part adhesive. However, when you have very small joins – no more than 4m in length, all told – you are better off using single part adhesive. So, before deciding upon which adhesive to use, calculate the total length of your joins. Overall, you can achieve a far greater coverage rate and a far more economical price by using two-part adhesive than you can when using single part to join two pieces of grass together. Winner: two-part adhesive, for any join longer than 4m in length. Repairs may need to carried out to an artificial lawn for a variety of reasons. Part of the lawn may have worn out through excessive use, been burnt by cigarettes or fire, or have become permanently stained. Repairs can be a delicate process and could involve carefully cutting out the affected areas and replacing each with a new piece of grass. New pieces are secured into position using the same process as joining two pieces of turf together, i.e. with joining tape and adhesive, as explained above. As repairs are delicate operations that can be fiddly at the best of times, using single part adhesive is highly recommended. That’s because you can very accurately and carefully apply single part adhesive through the supplied nozzle. Two-part adhesive is either poured or applied with a trowel, which can be messier than using a nozzle and, of course, the last thing you want is to be getting adhesive on the fibres of your turf, as it can be tricky to remove. Artificial grass can be installed to existing surfaces, such as concrete. We recommend that you secure the grass using adhesive. In this instance, two-part adhesive is the clear winner. We recommend that you apply a 250mm wide strip of adhesive to the entire perimeter of your lawn to ensure sufficient bonding to prevent your grass from lifting at the edges. As described above, you can cover far more ground with two-part adhesive in a much more cost-effective way. 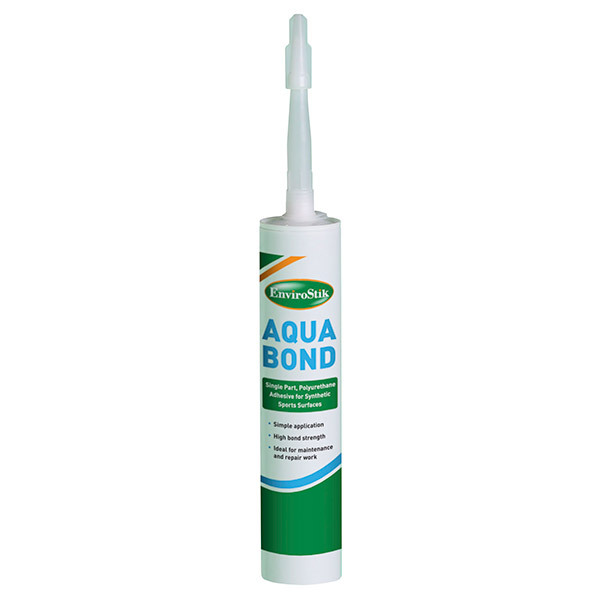 As you’ll need to apply glue to the entire perimeter, unless you’re installing an area with a perimeter of up to 4m in length, you’ll be needing more than 4 cartridges of Aqua Bond, and therefore two-part adhesive is the best choice for the job. 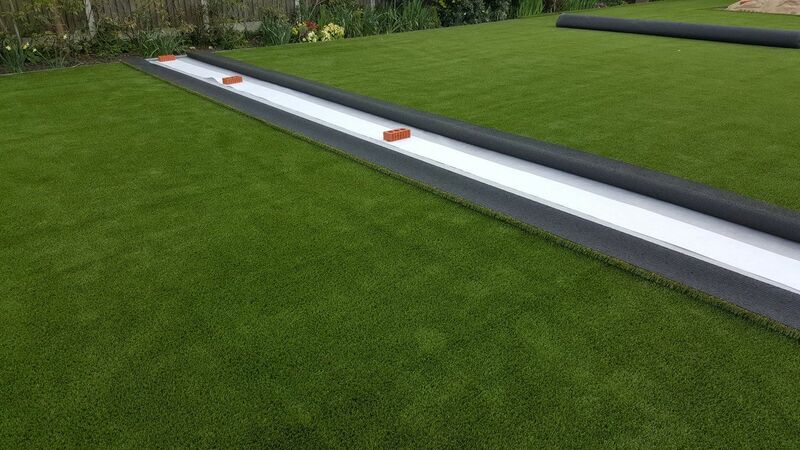 There are many different types of edging system that can be used when installing artificial grass. In some instances, you may choose to install a concrete edge restraint. If you decide to go down this route, then the only viable option for securing the perimeter of your grass is to use adhesive. The easiest way to apply adhesive in this instance would be via a plastic nozzle, as you’ll be able to deliver the glue more precisely than when using the two-part trowel method. 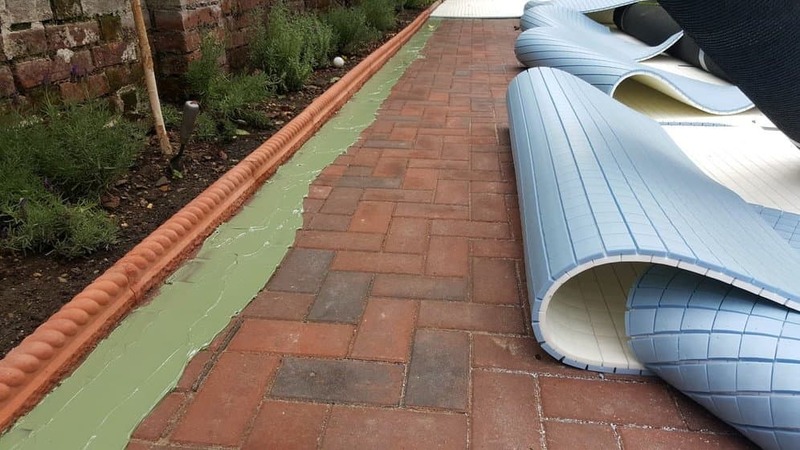 We highly recommend installing a foam underlay prior to laying fake grass on to an existing surface, such as concrete, paving slabs or decking, as it will prevent any undulations in the underlying surface being visible through your artificial turf. You can use either a 10mm foam shockpad underlay or 20mm foam shockpad underlay. You’ll need to use adhesive to first secure your foam to the existing surface and then to secure your fake turf to the foam. Therefore, using two-part adhesive really is a no-brainer in this instance as you’ll need to double up on glue. As we have said, for lengths more than 4m, two-part adhesive is the more cost-effective solution. As, in this example, we’ll need to be applying glue to both the foam and the turf, you’ll always be better off using two-part adhesive. Artificial grass adhesive is a versatile substance that has many different uses when installing artificial grass. Both types have their strengths and their weaknesses and deciding upon the best type for your own needs really depends on various factors. We hope that, with the help of this article, you’ll have a little more knowledge about the two different types of adhesive and their uses in order to make the best decision for your artificial grass installation. If you would like advice on your own specific situation, you are more than welcome to ask any questions you might have in the comments section below or to call us on 01245 931200; either way, we’ll be glad to assist. If installing your own artificial grass sounds like too much hard work, why not enlist your local NeoGrass Approved Installer to carry out your installation for you? Our expert installers will have the knowledge and experience necessary to advise you on the best installation practices to suit your own individual circumstances. Don’t forget, you can also request your free sample pack by clicking here.